Browsing through Howard Terpening’s “Tribute to the Plains People”, his “Passing into Womanhood” caught, and held my eye. Not just from the theme, nor the way he creates a realistic sense of what might be. No, it was the small bowl of red ochre that sits by the mother’s feet, and the red paint that covers the young maiden as she moves through the ceremony. Howard Terpening “Passing into Womanhood,” 1989. Back in the time that Europeans arrived in the Americas for the last and culture-changing time, the first Native Americans that they met wore little more than a coating of red paint, the Beothuk, being one such example. It is a tradition that Robert Griffing has used in his paintings of the period. 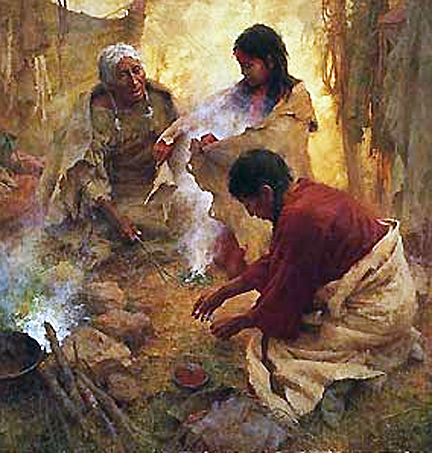 The use of red ochre – mixed with or applied over a grease is not, however, novel to the American tribes of the more recent past. 80,000 years or more ago South African archaeologists believe that the native inhabitants of the Blombos Cave were using red ochre for body paint. The tradition has descended to its use by the Maasai in Kenya to the present time. So when did the tradition arrive in the Americas? It does not seem to have been a tradition with those that came across from Siberia via Beringia, and thence into Western America. Instead those known as the Red Paint People now more scientifically referred to as the Maritime Archaic, appeared in the New England and Atlantic regions of Canada between 6,000 and 3,000 BP (years before the present). They first came to prominence when a local farmer turned up pockets of red ochre, and it was then discovered, first that there were polished stone tools within the pod of paint, and then further discoveries also found human remains, showing that the bodies had been buried with pots of ochre in the grave. 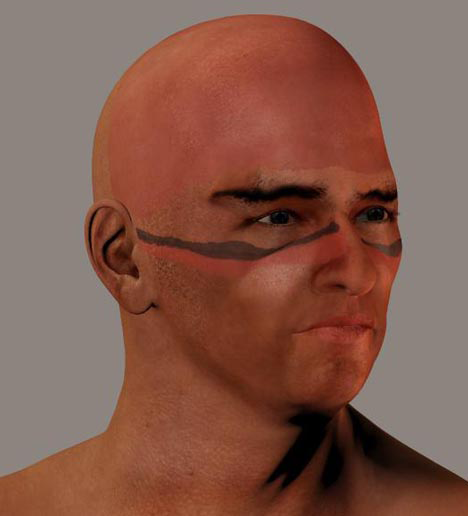 Paeo-Indians are believed to have lived in Maine since around 11,000 BP,(pdf), with the change from the chipped flint to ground stone tools occurring with the transition to the Archaic Period. With that tradition also came the use of the ochre paint, and the initial naming of the culture as the “Red Paint” people. The ochre was generated by grinding local haematite ore. As well as being called the Maritime Archaic, the culture is also referred to as the Moorehead Phase. Cemeteries have been found only between the Kennebec and St John’s rivers in Maine. 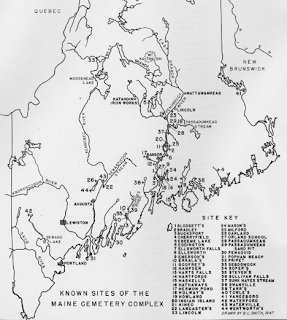 They include the Turner Farm site in Maine, and the Blue Hill Falls site with the Nevin shell midden. However, as investigators have looked for and found other sites, they have, to date, established that the earliest site was at L’Anse Amour site in Labrador. The site was occupied from 9,000 to 2,000 years ago, but the buried individual was a child laid to rest some 7,500 years ago. The body had been covered with red ochre, wrapped in a shroud of skins or birch bark, and placed face down, head pointed west, in a large pit 1.5 metres deep. 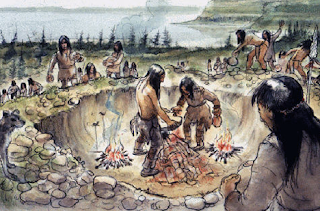 Evidence also indicates the use of ceremonial fires and the cooking and consumption of food. Offerings were made of tools and weapons made of stone and bone. These included a walrus tusk, a harpoon head, paint stones and a bone whistle.
. The burial grounds at Port au Choix in Newfoundland lie fairly close to this coastal site, and have the advantage of also including residual material from the nearby community. The site is younger than that at L’Anse Amour, dating to around 2000 to 1200 B.C. More recently Red Paint burials have been found in Wisconsin, dating from between 1,000 and 400 BC. The later dates are about the time of the shift to the Early Woodland period of American history, when pottery was introduced. Grave sites have also been found in Michigan, Illinois, Iowa, Indiana and Ohio. So it would appear that, as with the Clovis Points, the concept started in the East and spread Westward. Where did the idea come from? Well starting with the African culture cited above, Europeans have been burying people with ocher paint from the time of the “Red Lady of Paviland Cave.” That skeleton was, as it turned out, actually that of a young man, dating from around 30,000 years ago, back when there were still glaciers in the UK. It is the oldest “Modern human” skeleton found in the United Kingdom. Given that, of one puts this chronology into sequence, this gives an African-European-Eastern American progression, there is an implication (through the L’Anse Amour connection) that, as with the Clovis Point, there was a European connection to North America along the Northern perimeter of the Atlantic. L’Anse Amour also introduces funeral monuments to North America with the suggestion that it took at least a week for the local hunting band to build the mound, using local stone and boulders. The mounds that followed, moving down into Maine seemed to be more incidental, since some of the burials were found in the large shell middens that were built as the community harvested and consumed the local shellfish over many years. At the Turner Farm site, built around 5,000 years ago, the shells are mainly of clams with the advantage that the shells reduced the acidity of the local soil, so that bones could be preserved. This site has the oldest dates for human occupancy in Maine. Two reasons have been proposed to explain the lack of older coastal sites. The first is that the sites were drowned or eroded as sea levels rose during the past 11,000 years (Sanger and Kellogg 1989; Kellogg 1995). The second is that the early Gulf of Maine was not highly productive, a result of low tidal amplitude and poor circulation, and that there were scant resources to support people in a maritime adaptation (Sanger and Belknap 1987). Evidence for the first scenario may be found in the rare artifacts that have been dragged up by fishing boats in the Gulf of Maine and associated estuaries (e.g. Spiess, Bourque, and Cox 1983; Wilson 1997). The second reason is much harder to confirm. One conclusion from Maine coastal research is that the timing of the earliest visible occupation varies significantly along the coast, a result of localized rates of sea level rise and differential erosion rates (Sanger and Kellogg 1989). Another factor contributing to the pattern is that certain locations only became available for habitation when sea level had risen enough to make access possible and to create clam flats. Research conducted to date shows that the oldest extant Maine shell middens are in Penobscot and Frenchman Bays, where soft-shell clams were procured as early as 5,000 B.P. 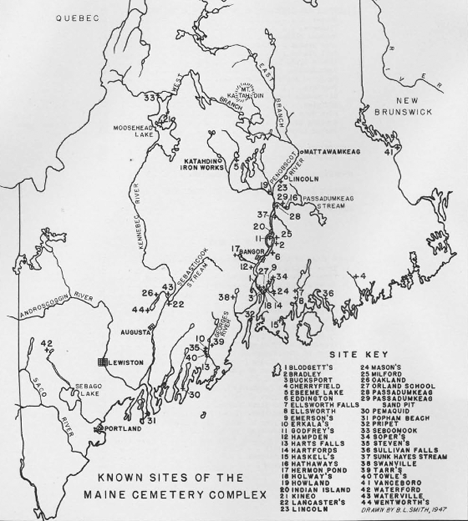 In Casco Bay, the earliest dated occupation, about 4,000 B.P., was associated with oyster shells at the base of a large midden on Great Moshier Island (Yesner 1984). Basal deposits in the oldest Casco Bay shell middens are routinely composed of oyster and quahog (Loomis and Young 1912; Sanger and Kellogg 1989; Yesner 1983), species indicative of warmer waters and a lack of intense sedimentation. A decline in the rate of sea level rise, increasing sedimentation, and colder surface temperatures have been proposed to account for intensive coastal settlement and the formation of soft-shell clam middens after 2,000 B.P. in Casco Bay (Yesner 1983). Interestingly the shell midden site at Taft’s Point at West Gouldsboro, ME, also included iron pyrite associated with the fire pits, the use of the pyrite as a fire starter is also considered a marker for the culture. The pyrite provided an early version of the steel which, when struck with a flint, was the source of sparks for the flint-lock rifle in later years, and historically provided the spark which was caught on tinder to provide the basis for a fire. Otzi, the remains of a man found in the Alps who lived 5,300 years ago used flint and pyrite as his fire starter. At Blue Hill, which lies at the mouth of the Penobscot River, the Nevin shell midden was the first to be found that included human remains. Remains of a total of 19 separate individuals have been identified at the site, which covered the period from 4,500 to 3,800 BP, at which time the culture seemed to “disappear.” However shell middens continued to grow as coastal settlements continued to consume the local bounty, and the use of ochre in graves seemed to move West, as noted above. The change in cultures appears to be marked with the introduction of pottery. Was this assimilation, or, as with later tribes, did the growth of the population cause the original inhabitants to “move on” as stronger cultures displaced them? We may never know, but – to return to the original motive for this short series – it does provide another point at which European customs appeared in an American setting, suggesting, from the chronology, that there may have been a European arrival perhaps 5,000 to 6,000 years or so ago. UPDATE The date is roughly about the time that there was a culture change in Britain, with the arrival of the Celts, the change from a worship of the moon to worshiping of the sun, and the start of construction of the stone circles, the most famous of which was Stonehenge. And, of course, there were druids and body painting, although, as those who remember the movie Braveheart will recall, the paint was wode, which is blue, rather than red. Freelance can be in different wings. Either you can be a freelance reporter or a freelance photographer. You can also do designing or be in the advertising field doing project on your own. Being independent and working independently will depend on your field of work and the availability of its worth in the market. If you like doing jewellery designing you can do that at home totally independently. You can also work on freelancing as a marketing executive working from home. Wanna know more, email us on workfromhome.otr214423@gmail.com and we will send you information on how you can actually work as a marketing freelancer. This is a very vast field and here sky is the limit. All you need is a computer and Internet facility. Whatever field you are into work at home is perfect match in the software field. You can match your time according to your convenience and complete whatever projects you get. To learn more about how to work from home, contact us today on workfromhome.otr214423@gmail.comand our team will get you started on some excellent work from home projects. Waterjetting 1d - Not quite that simple!